Do you enjoy watching the Olympic games? 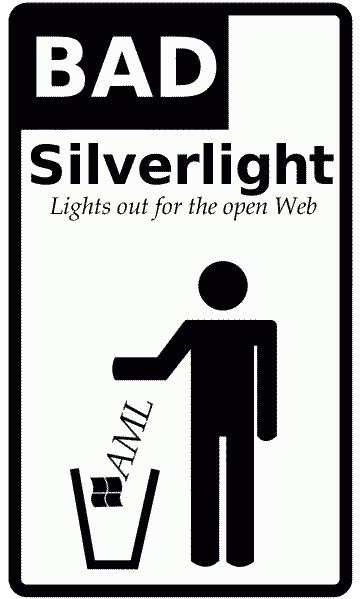 Got Silverlight? No? Then you may be out of luck after Microsoft’s partnership in the 2008 games. It’s also serving notice that Microsoft wants to be one of the major “channels” for Internet television. The main problem with this, as we have stressed many times before, is that only Novell customers receive so-called ‘protection’ for the use of Mono (and therefore Moonlight, which is incomplete anyway). This protection expires less than 5 years from now. By accepting Silverlight on the Web, Linux users put themselves in a position where Microsoft can claim that every Linux user owes Microsoft money and even demand and receive that money. Are all Linux developers even aware of the fact that Microsoft already makes money from their own voluntary work? Complacency is very dangerous here. Is Microsoft ‘Pulling a Netscape’ on Flash, Firefox, VMWare? According to that, it would appear that everyone is protected for the use of Moonlight (so long as it’s being used as a browser plugin). Now, I am not a lawyer, so my interpretation may be wrong, but it sure sounds like they are covered even if they received a copy of Moonlight from a distributor other than Novell. > , which is incomplete anyway). [incomplete] links to an article you published about Popfly, claiming that Moonlight does not work with Popfly… out of curiosity, I decided to try to view Popfly under Linux using Moonlight and was able to do so just fine. I was able to drag things around, drop them here and there, resize things, etc. So it would appear that your argument that Popfly can’t be used by Linux users is bogus. Perhaps you should install Moonlight to test things before saying that Moonlight doesn’t work? If that’s the case, then Microsoft’s own magazine, which is published in January 2008, is incorrect. It claimed no Linux support. Well, I’m not sure I see the connection between the link I posted and the Xandros-Microsoft deal. Seems to me that they are unrelated. The way I understand the Moonlight link is that it is all-encompassing, while the Xandros deal is, well, Xandros specific and being that the Xandros deal came about /before/ the Moonlight link I posted above, seems to me that Xandros users would still be covered for usage of Moonlight. However, even if the Xandros deal came post-Moonlight, I’d still understand the Moonlight deal to cover Xandros customers since neither deal impose any exceptions to the contrary. Again, I remind that I am not a lawyer, so my interpretation could be wrong. So all the article is really saying is that the Microsoft implementation of Silverlight doesn’t work under Linux. Well, “duh”. The mention of Moonlight seems to be saying that “Linux /will/ be able to render Popfly” and as I discovered this morning, it already does. Interesting information. I see your point. With regards to patents, be aware that Microsoft has a lot to earn with Moonlight (no wonder it supports it) because it can pretty much put Mono on as many Linux desktops as there are running Flash (that includes KDE user, for instance). Think of this as ‘installed base’. It would be naive to trivialise the issue and argue that just because Moonlight is released, there are no longer legal issues with Mono. Be aware that with Mono/.NET on every desktop, Microsoft will expand this further and have Linux playing by its own rules (did you know that Evolution extensions written in C# are apparently planned? ), This is not only risky; it’s totally unnecessary because there is no Mono ‘killer app’ (Silverlight is still docked in bay at the moment, so why bring out the beast?). Remember: when you are distracted and you start mimicking Microsoft technology to compete with Microsoft, you haven’t a chance. There are lessons about this in history. Did you notice that Miguel’s blog and the CNET article were both published before the link I pasted? That says to me that things have changed /since/ the CNET article was published. What once was true is no longer. Among more examples I could find if you are interested. I’m not sure I see how that contradicts what Lukas has noted. Please elaborate? Also, I am somewhat suspect of Matt Asay’s claims of Novell twisting his arm – so far all of the “arm twisting” emails/blog comments are public (Miguel blogged his email discussion with Matt Asay and the blog comment on Asay’s blog is, well, clearly also public) and they seem to me to be correcting what they see as false information and/or clarifying what was actually meant. To put things in perspective, lets say that I write an article claiming you said XYZ. You then follow up to my blog making a correction saying “what I /actually/ meant was …” – is that twisting my arm? Or is that merely correcting a mistake? I know it serves your purpose (and Matt Asay’s purpose) to spin a negative tone on it and thus make Novell look bad, but that doesn’t make it true. In this podcast he said that they asked him to be nice, IIRC (I listened to the one-hour recording just once). And then there’s Dana, but I can’t recall the details too well. I think they sent him E-mails also, but I’m not sure. Based on E-mail correspondences I’ve had, I can tell you there’s one person who criticises Novell in public because Matt no longer does this. Call me a skeptic, but Matt Asay pretty clearly has a grudge against Novell and that makes him an unreliable (as in, he’s not an objective) source. As far as Dana Blankenhorn, you yourself have agreed that the guy is a spin doctor in a previous article on your site. My point is that you can’t blindly trust what these 2 people have to say. Miles, Matt used to work at Novell and having read his writings for about 2 years, I can safely say that he had no grudge against Novell before the Microsoft deal. I can honestly say so. As for Dana, I do wonder where I said he was a spin doctor. I criticised him for other things such as mixing politics with technology (e.g. characterising Mark Shuttleworth as anti-America), but I can’t recall ever calling him a spin doctor. I was just browsing the Monologue and couldn’t help but notice a slew of Mindtouch posts about Dekiwiki. What struck me as odd was that just a few weeks ago, Matt Asay was talking (read: naming it the best thing since sliced bread) about Dekiwiki on his CNET blog and mentioned that he was so impressed with it that he just had to get involved with the project and has positioned himself as an Adviser to it. Googleing for Mindtouch, Dekiwiki and Mono – I discovered that Dekiwiki is Mono-based (which explains why it is all over Monologue). It would appear that Matt Asay has changed his tune about Mono. Dana Blankenhorn of ZDNet is retarded. His “analysis” of Shuttleworth’s statements is a “spin” (and not a very good one) regarding Linux that I’ve never heard before. It was important for this writer to point out that Ubuntu is not a US-based Linux distribution. It was important for this “writer” to use words like un-american. The article reads like it was written by a racist, a xenophobe and an MS Troll. You were either agreeing that Dana is a retard or you were agreeing that Dana is a spin doctor… or maybe both. Either way, you agree that his writings cannot be taken at face value. Haha, that’s hilarious about Matt Asay. Guess he never really believed any of that crap he vomited up about Mono or he wouldn’t be using it now. I’ll expand on that later. Thanks, Miles and Jose, for the information. @Miles: Oh, and by the way, here is what I said about Dana in that context. That is a pattern. It’s none of the above. It’s the political slant I was referring to, as well as the net neutrality debates in a blog about open source software. I agree with you, Matt. This suggests you are in agreement with Matt about Dana being a spin doctor. This seems to add that you also question Dana due to his tendency to make his arguments political. Matt, I agree with you[r] [analysis that Dana is a spin doctor]. I also said [that Dana has a tendency to make his arguments political (which I don't agree with)] when I first spotted that item. I hope you can understand how your words lead me to my conclusion on what you were saying. * Contain mentions of Microsoft when more comments/traffic seem needed. All in all, I do syndicate his blog and cite it quite regularly. The above are some of the less flattering observation, but if you want “spin doctor” consider Rob Enderle, Matt Hartley, and many of Novell’s employees.